After some video footage of Catholic high school students in MAGA hats went viral, media figures and Twitter users called for the students to be doxxed, shamed, and punished because the partial footage appeared to depict the students harassing a Native American veteran. The partial footage did not show the full sequence of events, and there remain controversies about how to interpret the full footage. 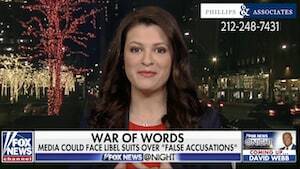 New York City employment attorney Silvia Stanciu at Phillips & Associates recently appeared in a debate on Fox News. The debate addressed whether the students of Covington Catholic who were criticized by the media and on social media can sue for libel and recover damages. The central legal question being debated was whether media figures who express their opinions about a viral video can be held liable under a theory of libel. Silvia Stanciu debated with David Gibbs, the President and General Counsel for the National Center for Life and Liberty. The debate began when host Shannon Bream read a statement by L. Lin Wood, who represents Nick Sandmann, one of the students. The statement explained that Mr. Wood's team would look over all of the allegations and threats, and they anticipate filing numerous lawsuits. Ms. Stanciu commented that social media and journalism are bound up together at this point. She found it worrisome that a fight against journalism was being contemplated. She noted that while Mr. Sandmann may have a basis to sue, based on his unfortunate situation, it is unwise to sue people for expressing their opinions. Free speech is inherent to America. In fact, Mr. Sandmann expressed his own opinion freely during the unfortunate events in Washington. The Fox host commented that one legal commentator had said that the boys may be harmed by the controversy as a whole, but that does not mean that they cannot also demonstrate harm arising out of a specific person's words. According to that commentator, they would need to show that the speech was an intentional lie. David Gibbs responded that the boys might be able to show that the comments met that standard. He argued that reputation is valuable. While people can give their opinions, he believes that this is different from ongoing defamation, and the students in question were being labeled as terrorists or troublemakers. He believes that journalists should be held responsible for that, since they are monetizing the attention that they get for their comments. The host commented that another attorney who represents other students had commented that the lawsuit might be groundbreaking. He believes that there should be consequences for abusing the power of the press. Ms. Stanciu stated that even if Mr. Sandmann pursues the case, he has a huge obstacle to confront. He is going to have difficulty suing every person who discussed what was happening in real time, as well as difficulty showing what the damages are. She noted that it would be hard to quantify what happened, and a long legal battle would ensue if he sued each individual who made comments or wrote articles when they were watching events unspool in real time and were fulfilling their duty as reporters. Reporters were involved because they were trying to expose the situation as it occurred, even if they were not in the field. Mr. Gibbs responded that the teenagers would not sue everyone. They would only sue journalists who behaved inappropriately and whose defamation threatened their reputations. He commented that we should hold people to higher standards to protect innocent people from being subjects of harmful speech, since the Internet lasts far into the future. He remarked that there may be children who have not yet been born who will read about the incident. Defamation can occur in many different settings, including a job environment. If you are concerned about defamation in the workplace, it may be important to find an experienced attorney to represent you. Call Phillips & Associates at (212) 248-7431 or contact us through our online form. We handle employment litigation in the Bronx, Queens, Brooklyn, Manhattan, and Westchester, Nassau, and Suffolk Counties, as well as Pennsylvania and New Jersey.